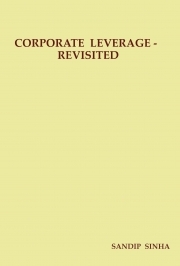 Description of "CORPORATE LEVERAGE - REVISITED "
A monograph extending the traditional classification and analysis of corporate leverage. and to analyse the proposed corporate leverages and de - leverages . The author is an Assistant Professor in Commerce in Dwijendralal College , Krishnagar, Nadia,West Bengal. Reviews of "CORPORATE LEVERAGE - REVISITED "